Bloomberg was the first to report the contribution, based on the RGA's Internal Revenue Service filings. 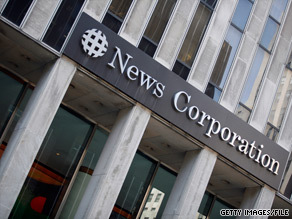 A review of the News Corporation IRS filings by CNN shows that a subsidiary of the company called News America Inc. made additional donations to both Democrats and Republicans in the 2010 election cycle, including $50,000 to the Democratic Attorneys General Association and $65,000 to the Republican State Leadership Committee. Those committees, as well as their Democratic counterparts, are 527 groups, meaning they are not subject to campaign finance contribution limits. While News Corporation has used its political action committee to shower Democrats with campaign contributions, the total of those donations is dwarfed by the $1 million check it cut to the RGA. Data collected by CQ Moneyline shows that News Corporation, through its political action committee, has contributed over $105,500 to Democratic candidates in the 2010 election cycle, while donating $74,700 to Republicans during the same time period. News Corporation's PAC has also donated $7,500 to Democratic-affiliated leadership PACs and $14,500 to GOP-related PACs. News Corporation, owned by Rupert Murdoch, has also given a total of $45,000 to other Democratic and Republican committees. On the Democratic side, that includes $30,000 to the Democratic Congressional Campaign Committee and $15,000 to the Democratic Senatorial Campaign Committee. As for Republicans, News Corporation donated $30,000 to the National Republican Congressional Committee and $15,000 to the National Republican Senatorial Committee. A corporation's PAC is subject to a maximum spending limit of $5,000 per candidate per year and $15,000 per political party per year. News Corporation is not alone among media corporations who donated to political parties and candidates, ultimately raising the issue of whether media companies and politics should mix. "This is one piece of the puzzle that the public should consider when they are viewing coverage of politics," said Sheila Krumholz, executive director of the Center for Responsive Politics. General Electric, which owns NBC, has also made substantial political contributions in the 2010 election cycle. For example, GE donated $688,900 to Democrats through its PAC this election cycle compared to $410,100 to Republicans. The company has also given $75,500 to Democratic-affiliated leadership PACs and $74,500 to Republican-affiliated leadership PACs. Meanwhile, GE has donated $237,000 to the Democratic Governors Association and $205,000 to the Republican Governors Association. The PAC of Time Warner, the parent company of CNN has given $70,500 to Democratic candidates in the 2010 election cycle compared with $41,500 to Republicans. Time Warner also donated $5,000 to the Democratic Senatorial Campaign Committee. The political action committee for Viacom, the parent company of CBS, has contributed $108,700 to Democratic candidates this election cycle and $64,000 to Republicans, according to CQ Moneyline. The PAC has also contributed $22,000 to Democratic-affiliated leadership PACs and $21,500 Republican-affiliated leadership PACs. Viacom also donated $4,000 to the Pennsylvania Democratic Party last April. And Disney, the parent company of ABC, has given $110,500 to Democratic candidates and $95,000 to Republicans through its PAC. It has also donated $16,000 to Democratic-affiliated leadership PACs and $20,000 to Republican-affiliated committees. Disney has also given $11,000 to Democratic Party PACs and $20,000 to Republican Party PACs. "The question is 'Are these companies credible when they say they are simply supporting the Democratic process,'" Krumholz said. "I think that is largely ignored by the public as an adequate explanation for these big checks." Only a million? Fox should have given them TEN million. Suppose...just suppose....that MSNBC was as clearly...AS CLEARLY....a propaganda mouthpiece for the Democratic Party, and General Electric gave just a million pennies to the Democratic Governors Association. How do righties think Fox News would cover that? Nobody blames MSNBC for being biased to the Democrats because they have hardly any viewers. As for the rest of them they don't compare in viewership to FOX either. Jeaslousy is all that is in this story and they just hate that FOX gets the ratings! fox is number one...for those that rquire political correctness...numero uno! get over it cnn....you are losers! "A disclaimer" I am in shock over the liberal bias in the news media. Charles Gibson of ABC News didn't even know anything about the Acorn scandal for 2+/- weeks when asked, Racheal Maddow refers to the scandal as "made up by FOX" and on and on and on. The problem is no one but FOX reports the news, CNN and all the others look the other way in sheilding the left from bad publicity such as the Blago scandel, Rangel, The Swamp herself Pelosi, Fannie and Freddie and on and on until it hits FOX. Without FOX no one would have heard about these scandals and yet your organization would crucify the right if the tables were turned. Where's the headline that Tom Delay was found not guilty. I am sure you will sponser Maxie's party or Rangels when the Dems sweep their charges under the rug ! How about Van Jones and the Presidents ties to Bill Ayers, Rev. Wright or where some ofthe stimulis money is going and to whom. You and the others have suceeded in brain washing the poor, under educated and under achievers in this country long enough and with unemployment levels unchanged, foreclosures increasing, riots in waiting lines to apply for low income housing defiance of federal laws etc. etc. etc. I can only wait until November to prove my point. Oh and how are those ratings that you never mention, you know where most of FOX news out ranks all of the combined cable newschannels, that's all combined !!!!!!!!!!!!!!!!!!!!!!!!!!!!. Why is there so much hate towards Fox News? Is it because they're not liberals? Either a lot of people are hopping on the bandwagon, or they're just blindly hating Fox because they're the only right-leaning network. More truth can be learned by hitting the off button than by watching Fox news. I can't imagine a real journalist working at Fox News. They're simply the PRAVDA of the American Taliban – the Republican Party. So many people tune if as if they were getting actual news – a sad commentary about the actual needs of modern conservatives to be fed news in keeping with their perception of reality. It's like watching those ridiculous wrestling matches on television and pretending to see something other than a scripted drama. This is a surprise because? faux news is a right wing uninformed lying news station. When you have insanity, little girl beck and the half term whatever she was as your "anchors" and the news that is really NOT about news but about lies. Let's not forget those three morons in the morning – doocey and the two others who think they have a classy show until you bring in the strippers! Oh yes, the family values station. What a joke. @four and the door – why don't you take a hike right through that door. You need to take your head out of the behinds of the rethugs. It is clear that objective news reporting is a dying art form. MSNBC is to liberals what Fox is to conservatives. However, News Corp has crossed the line and made it very clear they are going to push Murdock's political agenda. This does not bode well for our country as the partisan lines will only hardened with this move. God help America because we can do ourselves. As usual, the headline is grossly misleading. And, as usual, the liberals that comment did NOT read or comprehend the actual article. The other media donates way more money to the Dems than the Repubs, not even counting all the free air time and leg-tingling praise the Dems get. Fox News labels their news and commentary. MSNBC, CNN, NBC, CBS, ABC, etc label their commentary "news" and rarely present a balanced viewpoint. Fox at least brings a balance of Dems and Repubs to panel discussions where someone like CNN brings 5 liberal Dems and an almost-moderate Dem to their panels. Fox News donate 1 million to RNC call themselves Fair and Balance and that some how the Democrats fault? My God how dumb is the people on the right think this is okay. Is anyone really surprised? Regardless of what they claim. Anyone with a brain knew they were in the bag for the GOP. hahahaha, this is news? You think Dan Rather, when he was at CBS, withheld donations to the Democratic party because he was a journalist? You think 90% of the workers at CNN haven't contributed to the Dems as well? What about NBC, when they were owned by GE and GE actively solicited the Obama administration? Where was the outrage then? This is so low on the "news meter" that I can only assume it's a slow news day. Every organization is entitled to make donations as they see fit – even news organizations. I hope God gives Murdoch eternal damnation. Here's a guy who has probably the most power to do good on this planet. Media clearly influences people. Unlike the billionaires that Buffett is putting together, this maniac Murdoch, in his ever higher greed, only cares to make more money, regardless of the terrible results he produces for the common man. By giving idiots like Hannity and Beck a place to spew their craziness, he perpetuates putting corporate puppet Republicans in office that ultimately make it easier for corporations to continue to rule over everyday citizens. Sadly, he also creates nothing but crazy paranoia in the minds of the many idiots and rednecks that breed nothing but hate in this country and for the world in general. By watching Fox you'd think this entire planet is our enemy. By creating Fixed News and spewing nothing but distortions and lies to people too stupid to know they're being made fools of, Murdoch, you have wasted a beautiful opportunity to speak for the people and to do good on this planet with your immense power. Shame on you, you terrible evil man. Those who profess that all media, ex Fox News, is liberal are truly uneducated mental midgets. it's a shame..........a mind is a terrible thing to waste! Hard to listen to the DNC's outrage when most of the mainstream media has a tendency to lean to their side. Consider the lack of inquiry about Obama's prior experience to qualify him for the presidency. Even democrats are understanding this to be a big issue. Having said that, it is disappointing to see Fox take this step. The conduct of our national media, liberal and conservative, is disheartening. They could use their influence to promote honest debate. Instead, they focus on ratings and promoting their political agendas. The $1M is pale in comparison to the value of free access the GOP has to FOX opinion pieces. FOX really should clean up their act if they want to be seen as F&B and start to challenge some of the absurdities one hears as facts.